I didn't write much concerning the Gay Marriage ruling this past week that occured within the Supreme Court. I figured I didn't have to. Everyone else is already. I have, however, gotten into quite a few heated discussions about this topic as well as religion on Facebook. 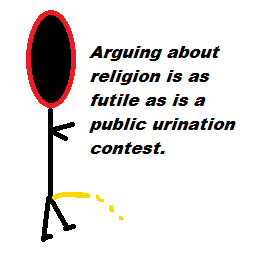 Fighting about religion is just as futile as is having a public urination contest to see which one of us can whiz the furthest. It might be fun, but what good does it really do? Is anyone really going to ever change their minds about what they believe? Maybe some will, but I know I'm not going to. It’s embarrassing now that I think about it. How could I ever stoop to that level -- arguing about religion? I'd rather get caught peeing in public than ever bother with that ever again. What Good Exactly is Religion? Does that mean we should abandon our faith? No, I don’t think so. I believe what I believe, and like most people, I will not easily change my mind about it. Why should I? In spite of everything, it’s the one thing that’s kept me sane at least most of the time. It doesn’t mean my faith was never challenged. There’s been many times when I thought about no longer believing what I believe. Then, something would always somehow bring me back to it – usually adverse circumstances. I had a bad habit of drifting from my faith when things are going well. It is usually at that time when I would take what I believe for granted and not practice that faith as much as I should. Sometimes, the return to my faith might be met with anger. I’d lash out at the one I believe in as if it’s Yahveh’s fault I grew distant. Then, I’d humble myself if only for a few minutes to recognize I can’t do it on my own. At that point, I am reunited with The One I believe in. I purposely wrote this post without any mention of the one I do believe in and I purposely decided to not quote any Bible verses in writing this. That’s what Yah says to the Israelites through Mose after appearing to him in the burning bush. “I AM is my name forever,” says Yahveh, “and this is my memorial to all generations,” says Yahveh. “I AM has sent me to you,” Yahveh says to Moses. Reference for all of above: Exodus 3:1-16.